The shoulder joint is one of the most complex joints in the body and it range of movement is greater than any other joint in the body; however what it gains in manoeuverability it loses in stability – making it highly susceptible to injury and trauma. Your physiotherapist will interview you and discuss how your symptoms developed, what limitations you are experiencing and what worsens/lessens your symptoms. This will be followed by an orthopaedic examination which will lead to a diagnosis – probably of one of the conditions above. One of the most common injuries to the shoulder is damage to the tendons which hold the arm bone in its socket – variously described as impingement syndrome, tendonitis or rotator cuff injury. Treatment for such an injury is based on initially reducing any inflammation and accompanying pain from localised muscle spasm and tendon involvement. Once these symptoms have settled treatment will be focused on improving the mobility of the shoulder through mobilisation of the shoulder, mid back and neck. The Rotator Cuff muscles are susceptible to cumulative/overuse injury. 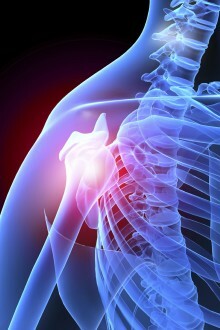 One of the leading causes of cumulative injury is poor posture and muscular imbalances which disrupt the normal biomechanics of the shoulder leading to alteration in the position of the humerus within the shoulder blade during arm movements (scapula-humeral rhythm) – hence specific scapula stability exercises will also be prescribed to help improve the biomechanics of the shoulder girdle helping to reduce further impingement and minimise the risk of re-injuring the shoulder once we have alleviated the symptoms. Poor posture or poor exercise technique are some of the main causes of shoulder pain; the following tips may be useful. Carefully adjust your car or work station position – speak to us for individual ergonomic advice. Use pain relief (in consultation with your GP/Pharmacist) – pain worsens your posture & disturbs sleep – there are no prizes for being in pain! REST – beneficial rest is a necessity for allowing the symptoms to settle. Never lift weights which are too heavy for you – it sounds obvious, but so many people do!